Represents California's 29th Congressional District. He is serving his fourth term in the House. What policy areas does Rep. Cárdenas focus on, as expressed by his press releases? Learn more. What topics does Rep. Cárdenas talk about in his recent press releases more often than other members of Congress do? Learn more. What members of Congress use language that is most similar to Rep. Cárdenas in their recent press releases? Learn more. H.R.2300, a bill sponsored by Rep. Cárdenas, was referred to the Committee on the Judiciary, and in addition to the Committee on Education and Labor, for a period to be subsequently determined by the Speaker, in each case for consideration of such provisions as fall within the jurisdiction of the committee concerned. H.R.2300: To establish a grant to provide mental health services and behavioral health services to at-risk youth, and for other purposes. 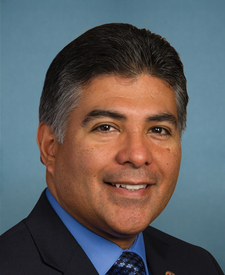 H.RES.210, a bill sponsored by Rep. Cárdenas, was referred to the Subcommittee on Crime, Terrorism, and Homeland Security. H.RES.210: Expressing support for the designation of the month of April 2019 as Second Chance Month. H.RES.266, a bill sponsored by Rep. Cárdenas, was referred to the House Committee on Oversight and Reform. H.RES.266: Recognizing March 31 as "César Chávez Day" in honor of the accomplishments and legacy of César Estrada Chávez.